The passage from Jost Van Dyke, BVI to Key West, FL was the longest of our trip at 1,143 miles as the crow flies, taking us 6 days and 22 hours. My brother and his family left BVI on Sunday morning. We had planned to relax for a few days before preparing to leave on Thursday. Mother Nature had another idea. The best weather window had us leaving on Tuesday, so we got working. We went to the grocery store to buy food for passage on Sunday and I started passage cooking. I spent Sunday evening and most of Monday cooking – a total of 6 dinners cooked and packed in the fridge or freezer. Whew! Meanwhile, Doug got the boat ready, checking oil levels, inspecting the rigging, entering waypoints into the chart plotter, etc. The kids moped around wishing we weren’t leaving. Happily, we ended the day with our last dinner in the Caribbean at the iconic Foxy’s Restaurant. Tuesday morning was last minute prep including getting out the ditch bags (bags that go into the life raft in an emergency), charging the emergency satellite phone, and packing insulin into the ditch bags for the kids. We checked out of customs and immigration and bought 3 loaves of the amazing cinnamon bread sold under a tent since the bakery was demolished in the hurricane. We left Jost Van Dyke around 1pm feeling melancholy about leaving the Caribbean and heading home. But it was a perfect day for sailing – sunny, clear, and 15 knot winds. Followed by an equally idyllic night – clear with a bright moon most of the night. On Wednesday, “the sea she is vast” was the saying of the day. We saw few ships and no land. It was just us, blue skies, a few puffy clouds and blue ocean. We were on the same point of sail (downwind, starboard tack) since we left and the winds were steady, so the boat practically sailed itself. A few cargo ships passed miles away. Watching them in the binoculars was our biggest entertainment. We mostly listened to music, talked, read, and stared out at the sea. It wavered between lovely and peaceful, and downright boring. The big excitement of the day came at the 11pm watch change. We jibed! For the non-sailor, this is switching from the wind blowing from one side of the boat’s stern to the other. And to be clear, this is NOT a big deal. But when absolutely nothing has happened in 36 hours, it’s what passes for big excitement! Thursday was very much like Tuesday and Wednesday – beautiful, sunny, blue, perfect winds. We did a few lazy jibes as we made our way toward Hispaniola. Mostly we struggled with the deep sleep deprivation that sets in around day 3. The only opportunity to sleep was when we were “off watch” every 3 or 4 hours. It takes about half an hour to fall asleep, and we wake up 15 minutes before the next watch to get ready. So, at best, that’s 2 or 3 hours and 15 minutes of sleep at a time. And for those first few days, it was hard to sleep when it’s daylight. We were happy, but tired. Around midnight on Friday, the winds and waves began to pick up. Nothing crazy. 20 knot winds with a few higher gusts and swells around 5 feet. Andy and I were on watch. By 1am there was a lightning storm in the distance, and the wind was heeling Boundless over more than we liked, so we decided to furl the sails (roll them in to make them smaller) to have a safer and nicer ride. We started with the mainsail. We have an in-mast furler that rolls the sail into the mast. The basic process is to head closer to the wind and let out the main sheet to de-power the sail, loosen the outhaul (the line that pulls the sail out the mast) to slack the sail, and press a button to activate the motor that furls in the sail. We did all that… and nothing. The sail didn’t roll up. And yes, furling the main was also our problem on the passage from Bermuda. Unfortunately, this was a different and less obvious issue. We adjusted things and tried a few more times. Still no luck. The wind and waves continued, oblivious to our struggles. The sails where flapping loudly as we tried each time to furl the main and waves were sometimes crashing on deck. This wasn’t fun. The furler has a manual crank near the bottom of the mast that we can use when the furling motor doesn’t work. I left the relative calm and dry of the cockpit to try cranking. The manual crank appeared jammed. We again tried a number of times to no avail. I was tired and frustrated. Then another wave came over the bow and soaked me. Conditions weren’t crazy and I wasn’t scared, but I was really tired and annoyed. All I wanted to do was change out of my wet clothes, curl up in bed and go to sleep. At this point, the chaos had gone on long enough that Doug and Erin woke up and joined Andy in the cockpit. I came back in to the cockpit from the foredeck and we took a break. We were all in sleep deprivation mode, it was dark and wet, and we needed a few minutes to think. We turned on the motor and furled in the jib. This gave us more maneuverability and less sail in the higher winds. We made a number of adjustments, tried to furl the main again – fail, repeat, fail, repeat. It was almost 4am when we called it quits. Doug had gotten the latest weather data and it looked like the winds and waves would recede soon. Andy and I went to bed. Unfortunately, we both had way too much adrenaline pumping to sleep much. The winds started to calm, Doug and Erin turned off the motor, pulled out the jib and sailed on. Doug and Erin were also exhausted having woken up half way through their off-watch, but happily the rest of their watch was uneventful. By the time Andy and my next watch started, the winds and waves were perfect and we were fine sailing on with a full main. Doug and I did some diagnostics, including Doug partially taking apart the furling unit at the mast to no avail. We then tried to make a plan. Should we take the mainsail down knowing that cruising sails are not made for easy take down or up, so we were committing to motorsailing with no main all the way to Key West? If so, when and where? Should we anchor off one of the Bahamian islands and try to repair and/or drop the sail? Should we wait until we get to Key West? The options seemed overwhelming. We realized we weren’t thinking straight and were way too sleep deprived to make good decisions. Doug checked the weather forecast (we get detailed marine weather that is updated twice daily via satellite) and the wind was projected to die as the day progressed and stay that way for a few days. We would be absolutely fine with the sails as-is. We decided to do nothing with the sail for now and focus on catching up on sleep. The wind died in the afternoon as predicted. We furled the jib back in, centered the main, and began motoring as the waves settled. It was a calm day and we all tried to sleep whenever we could. We usually have 2 people awake during each watch. Today, with little wind or waves and nothing but water around, one person on watch would sleep half their watch on deck and then swap with the other person to catch a few extra hours of sleep. After focusing on sleep for a day, Andy and I woke up Saturday morning feeling like new people! Doug and Erin were just ending their 5am – 8am watch and they also felt great. The latest weather had calm winds (e.g. not enough wind to sail) through Sunday, but winds building to over 20 knots by Monday and continuing to build through Tuesday when we were scheduled to cross the Gulf Stream and arrive in Key West. With a clearer understanding of the weather situation and clearer heads, it was evident that we needed to either fix the furler or take down the sail by Sunday before the weather turned. We decided that we had done all the diagnostics we could with the sail up and that the weather conditions were perfect to pull down the sail now. So down it went. Next, we turned to more diagnostics. Doug further took apart the furling unit and couldn’t find anything wrong. We also couldn’t identify any issues at the bottom of the mast. We decided that I would go up the mast to check if there was anything obviously wrong up there. The only other time I went up the mast at sea was in 2000, sailing back from Bermuda on our previous boat. We hadn’t realized how much harder it would be to work at the top of the mast at sea, so I wasn’t totally prepared and I came down with bruises all over my legs. This time, we knew better! The issue is geometry. Swells and waves at the waterline are multiplied 76ft up at the top of the mast. As the mast swings, it’s hard to hold on, particularly when your hands are busy with diagnostics and repair. We knew that going up when the seas were calm and we were motoring with the waves was important. Also, this time I knew to wear pants instead of shorts. The mast gets hot in the sun and sweaty legs don’t slide on the metal. Plus, once I was at the top and working, I mostly held on by my thighs. Pants were important! Doug and Andy hauled me up the mast while Erin navigated the boat and was in charge of communications. I was physically hauled up by Doug via a bosun’s chair – a very sturdy seat with leg straps and canvas sides with rings at the end that attach to a halyard (a line that goes to the top of the mast). Andy managed a second halyard attached to a climbing harness that I wore for safety. If the bosun’s chair, the main halyard, or any hardware on that rig broke, I’d have a fully redundant system via the harness. I felt quite safe. Everything I needed (tools, VHF, phone to take pictures) was either tied to me or had a wrist loop so I didn’t lose anything overboard. I even had a line leading down to the deck with a bag at the end in case I needed to pull up a tool I didn’t have up with me. That’s not to say that it wasn’t scary. It was, but also fun. The seas were fairly calm, so even at the top of the mast, the swinging wasn’t too bad. From time to time a larger swell came by and I would swing off the mast a bit, but not much. Once at the top, I did more diagnostics. Doug had a theory that maybe the furler was stuck where it attaches at the top of the mast. Or maybe it had broken off its bracket. Or maybe something had gotten fouled up at the top. Unfortunately, no. After about an hour up there, having Doug roll the furler in and out (it would go about ¾ of a turn in each direction before getting stuck) and checking different things, everything looked fine. I lingered up there a bit enjoying the views and taking a few pics. The water was super clear and I could see tons of fish swimming around the boat that we can’t see on deck. It was beautiful. Erin even took a video of me coming down the mast. I came back down and we rolled up and stowed the mainsail in a bag on deck. We were going to have to finish the rest of the trip without it. Doug had already calculated our fuel levels and we were fine to motor the rest of the way to Key West with plenty of diesel to spare. Motoring isn’t as fun as sailing, but it would get us home safely. And according to the weather forecast, when the wind picked up late Sunday/early Monday, it would be behind us, so with luck we could sail with just our jib. It was 2pm by the time everything was stowed away and cleaned up from both the sail removal and going up the mast. We hadn’t fixed the problem, but it was a fulfilling day and we felt good about our go forward plan. Sunday brought some of the calmest water we’ve seen with the wind meter often not measuring any wind at all. It looked like we were motoring Boundless through the largest swimming pool ever. We passed lots of cruise and cargo ships as we transited the busy Old Bahama Channel between Cuba and the Bahamas. Doug was lucky enough to see a pod of dolphins playing along our bow. It was mostly back to wavering between peaceful and bored. By Sunday night the winds began to pick up. We unfurled the jib and motor-sailed (we called it “Frankensailing”) through the night along the channel. Unfortunately, the increased waves also brought a very unnerving noise to Boundless. The furling system includes a tube that runs the full 76ft up through the mast. Normally the tube is stabilized by the sail – either its pulled taught when the sail is out, or its wrapped by the rolled-up sail. Without a sail, the furling tube clattered and echoed through the mast with every roll and swell. It was a feat of determination to not let the sound make us crazy! The winds stayed a moderate 15 knots much of the day Monday. We continued to Frankensail, continued to actively try to ignore the incessant clanking, and began to plan our arrival into Key West. As much as I was tired of Frankensailing (much less peaceful and lovely than sailing), I was feeling a little sad that this would be our last day at sea. I’ve been thinking a lot about what this trip has taught us about ourselves and how its changed us as individuals and a family (more on that in a future post). Passages give you LOTS of time to think and lots of time to chat with the rest of the crew. I was feeling mixed – wanting this passage to end and wanting it to go on a few more days! We entered the Gulf Stream Monday night and the waves got larger and more choppy. This was expected, but not good. Normally when under sail, a sailboat heels to one side. There’s some rocking around from that point, but we stay leaning to that side and we can stabilize ourselves and move about the boat without too much trouble. Without the mainsail providing stability, the Gulf Stream had its way with us. We rolled from heeling on one side to heeling on the other, back and forth. Moving around the boat was challenging. And sleeping was definitely not happening. We couldn’t keep from rolling around in bed, even when pushed against a lee cloth and pillows all around. And did I mention the clanging sound of the furler against the mast? Our nerves were frayed. When we exited the Gulf Stream and the waves calmed off Key West, we were ready to be done. It was a beautiful, clear morning as we made our way through the channel and dropped anchor off the end of Key West. We certainly earned our arrival beer on this trip! I think you should publish a book. Your blog is so entertaining!! Remember I said maybe I’d want to do an offshore passage with you one day? I soooooo take that back. We wouldn’t send you up the mast, I promise! Very nice safety on the mast excursion, well done Team Sharpe! I was absolutely thinking of you as we were setting up all the redundancies and safety. When I thought of skipping something because it took more time, I remembered you telling me that bad things usually happen when bad luck + stupidity or bad planning come together. I didn’t want that to be me! WOW! What an adventure 6 days and a roller coaster on the mast. I hope we get to see you this stunner. I got a bit woozy just watching your videos! The Boundless crew are amazing! We are awfully glad you got through it all safely. And we agree, your book would be a great read. Love reading your blogs! I often think about what I would do in a situation like this… the answer is invariably that I would not be as calm as you and Doug! Nice to live vicariously on your adventure. Usual voyage, hours of boredom, moments of panic. Good to hear you are back in USA. Looking forward to hearing about the Cuba adventure. 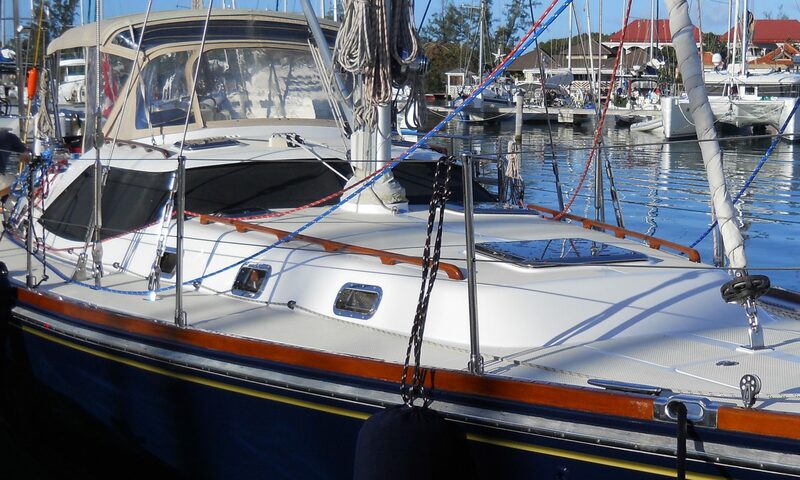 What was the “fix” for the in-mast furling jamb?